We are just five kilometres from Fitzroy when we have our third puncture of the trip. Another nail. The team swings smoothly into action and the old tyre is quickly removed. We quickly move to get the new tyre in place. Roger sits on the ground holding the wheel in place with his feet. In doing so is sitting so that he is partly in the road. Not ideal with road trains going by. I quickly get all six nuts on the wheel and tell Roger that he can now move. But Roger, as is his wont, clearly desires to be a target for moving road trains. Despite being told several times that it is ok to move, he ignores all of us and insists on demonstrating that his judgement of tyre changing is more important than death by road train. Clearly even though I had all six nuts on the wheel, there is still the nut on the ground who would not change his mind. We find the main town caravan park which is pleasantly green after the dust of the last few weeks and we decide to stay a couple of nights. As we are early we are able to pick the most shady spot in the entire ground and proceed to spread out an occupy as large an area as possible. Grass makes one greedy. Before we can get set up, we need at least one more extended conversation about the best way to park the vehicle. This sends Kaylee into a psychological meltdown and she retires to her chair to eat the two picnic bars she has bought. Chocolate really does cure all psychological ills. It is the mental equivalent of cable ties. 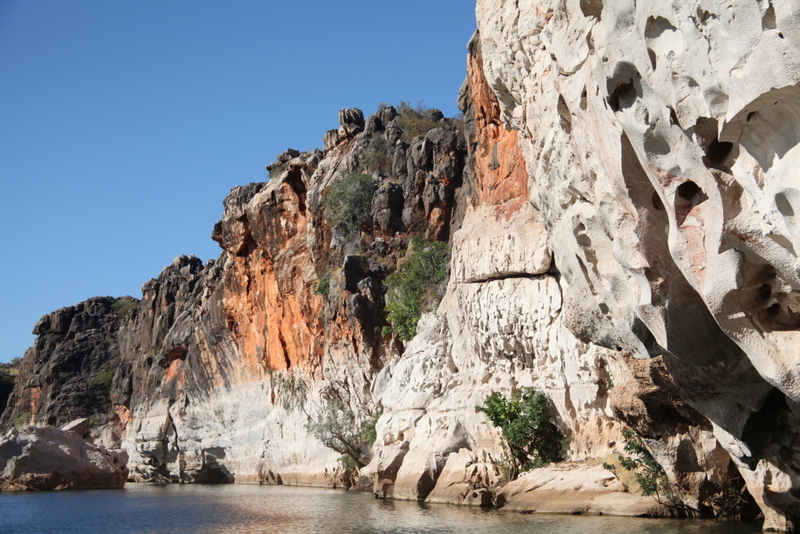 Our main goal in Fitzroy is to take a squiz at Geikie Gorge via a boat tour. But there are several subsidiary tasks including catching up with three weeks worth of emails, booking onward airfares, dealing with caffeine withdrawal symptoms, laundry (to avoid having to turn the jocks inside out for the fourth time) and sending off miscellaneous cards to various people to whom we have promised them. My first job, given we now have no spare tyre is to ring our long-suffering vehicle hire company owner, Nathan, and tell him of our latest trauma. I first explain to him, however, that we are running out of cable ties with which to hold the vehicle together. This seems to make him a little nervous, before I explain that I am joking and that we have only used one packet of cable ties so far. Fitzroy Crossing brings new opportunities for each of us to demonstrate our peculiar tendencies. 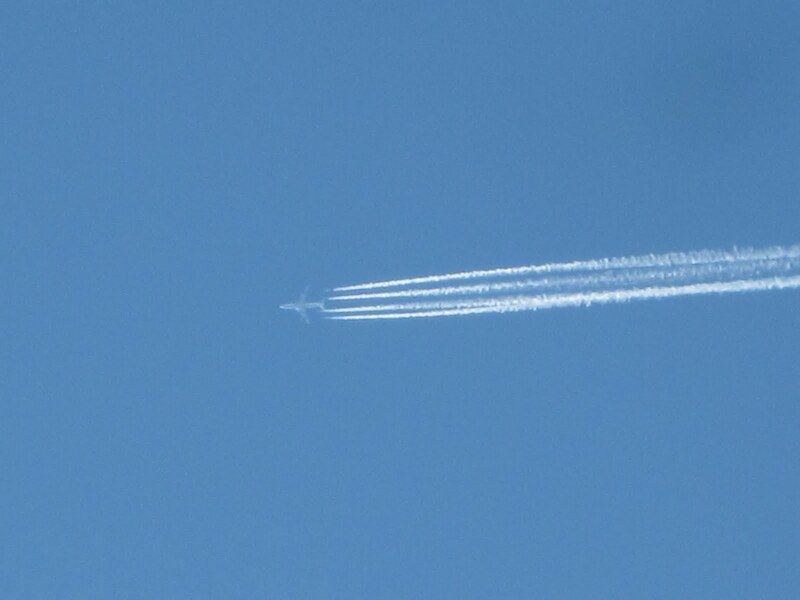 Jill (she of the extreme excitement about very weird things) becomes incredibly excited at seeing a……white plane…flying overhead. Apparently she has never seen a white plane before and although none of the rest of us are very excited at seeing a white plane at 20,000 feet, it does at least give me something to write about on this blog. More excitement, for Jill, is engendered by the site of Best and Less. This reaction also generates a level of incredulity among the observing masses. Apparently the excitement is a form of pavlovian response due to Best and Less being the only stores Jill experienced in various country towns during her youth. We spend a significant part of the day patronising the caravan park’s cafe as this provides us with an opportunity to re-charge both coffee and computers. We have also discovered they serve scones, so afternoon tea is in order morning, noon and night. We also have to investigate options for Kaylee fly back to Melbourne for a few days as a friend of ours, and especially of Kaylee, is ill. So much time is spent poring over travel and flight timetables. In the end however the decision is delayed by the news that the friend’s operation is will occur later rather than sooner. 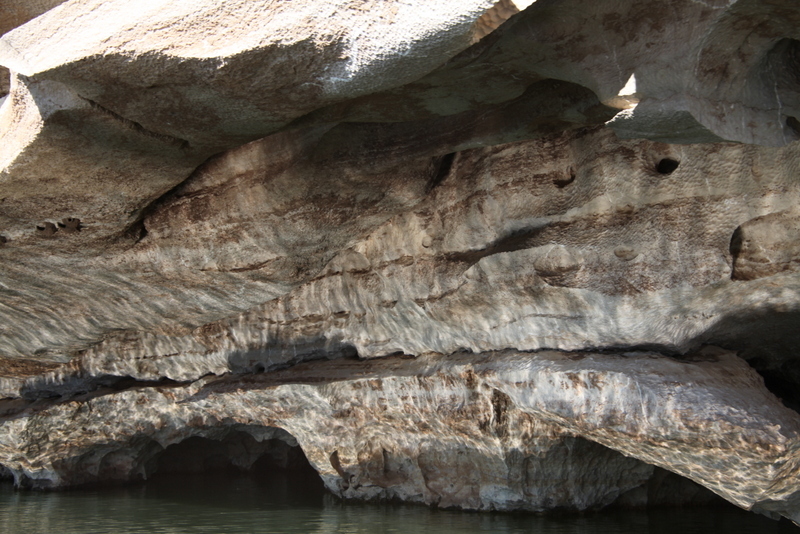 On our second day we take an afternoon tour of Geikie Gorge. The gorge is a pretty impressive bit of landscape and one gets some idea of the floods that sweep through here during a big wet when one witnesses the flood levels. 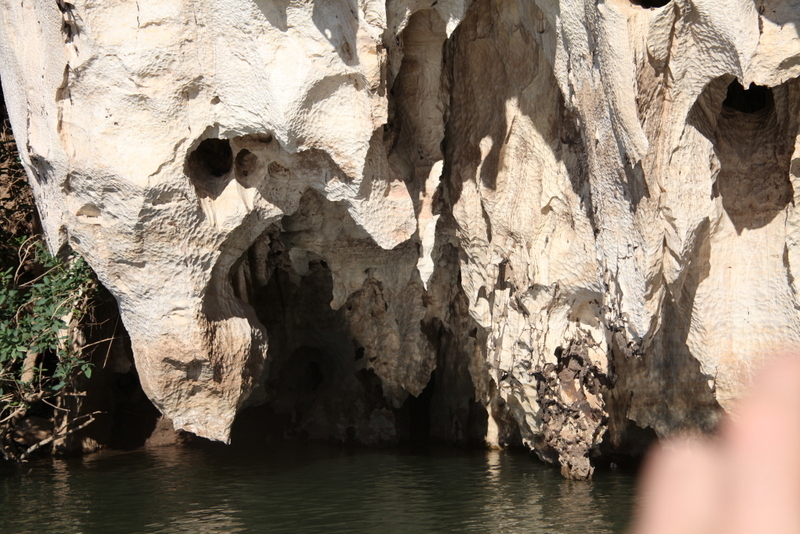 The mark is some 14 metres up the cliff faces on what is a fairly wide river. Our guide tells us that the locals know what size flood they are going to get each year by watching the freshwater crocodiles. The crocs have to lay their eggs on the sandbanks out of reach of the seasons floodwaters and depending on the size of the coming flood they move up the bank, always keeping just out of reach of maximum floodwaters. Who needs the Bureau of Meteorology? 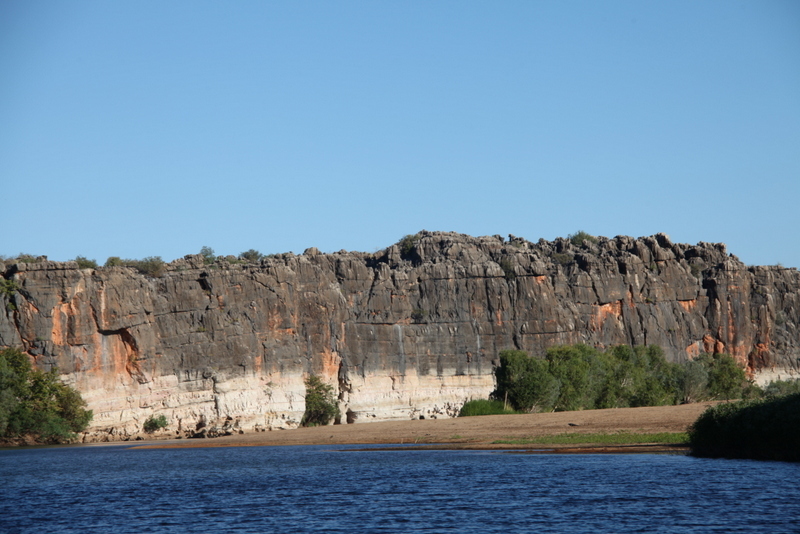 Our guide is ranger Dan and he gives us an informative tour of the gorge including about the endangered Sawfish of which the gorge’s population of 40 make a substantive part of the national population. However his crowning achievement was explaining the name of the swagman in the Banjo Paterson poem/song, Waltzing Matilda, is Andy. “Andy, sang as watched and waited till his billy boiled…..Andy sang as he shoved that jumbuck in his tucker bag”. Our second day at Fitzroy allows us to indulge in another form of camper envy. Two more vehicles from the fleet of “Drive Beyond” have turned up at the campground. This allows us to compare notes on the vehicles and decide who has been dudded in the equipment supply department. Our last night in Fitzroy Crossing was to have been spent at the Tin Can cinema and suitably dressed and spivved up we turned up on time for our film, along with eight others. The ten of us mooned about outside the cinema speculating on if we could break in an run the film ourselves since, sadly, the projectionist must have had other business. After half an our of watching the comings and goings of the patrons of the Crossing Inn, which was just across the way, we all decided to pack it in for the night. Before we can leave town in the morning we have to get our tyre fixed, so Roger and Jill head off to Doctor Sawfish’s tyre repair service. Only in the Kimberley is the local tyre repair service also a glass blower in the off-season. He runs a glass gallery immediately next door to his tyre shop. Roger and Jill are unaware of this and turn up to both get the tyre fixed and see the gallery but cannot see the gallery until their tyre is fixed since Dr Sawfish (http://www.drsawfish.com/about-us/) cannot do both at the same time. Once the tyre is done it’s off to Derby.